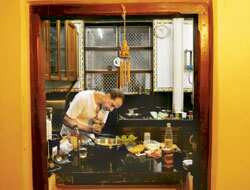 Mumbai-based fashion designer James Ferreira started cooking out of necessity. As a 25-year-old who left his family home in Khotachiwadi, Girgaum, to live alone in Bandra, he had to cook because there was no one else to do it for him. Now 52, he’s back in his sprawling heritage home where Bahadur, his man Friday, is the designated cook for the family of two (Ferreira and his mother). Ferreira steps into the kitchen only when he entertains, twice a month. His reputation as a good cook is so firmly established that, he says, “Once when I threw a party and got my food catered, all my friends were terribly disappointed". Busy preparing his collection for Delhi Fashion Week when we met him, Ferreira is on the phone giving instructions to Bahadur, who is out shopping for ingredients. He’s making two of his signature recipes—Beer Chicken and Orange and Gouda Salad. “I picked up this chicken recipe from a friend of mine and, like I usually do with most recipes, I gave it my own touch by adding Cointreau and the Amul butter, which I swear by," says Ferreira. Finally, Bahadur returns and Ferreira issues instructions. Bahadur gets busy peeling the oranges and Ferreira, sipping tea and with a cigarette dangling from his lips, transfers the marinated chicken into the baking dish. “The ash won’t fall into the food, no?" his mother, who is watching the proceedings, jokes. As a community tradition, the family has always used fresh masalas. “My mum buys the raw ingredients and women from the interiors of Maharashtra come here and pound the masalas for us. They sing songs while working. Packed masalas can never taste like that," he says. By now, the kitchen smells of roasting pepper, chillies, vinegar and oranges; Ferreira is popping cheese, nuts or orange segments into his mouth all the while. Now, he takes some dressing on to his palm to taste. Besides traditional dishes such as sorpotel and vindaloo, continental food is his favourite. He doesn’t eat out often but, as he puts it, “for sushi I’ll go anywhere". Ferreira removes the dish from the oven and now there’s another fragrance added to the mix in the kitchen. While Bahadur prepares the sauce, Ferreira has already taken the salad to the table and started on it. The tangy and nutty mix tastes even better than it looks. “I never get to eat like this. Usually when I’m cooking for a party, I’m too tired to enjoy my food," he says, digging into the chicken next. The smoky taste, combined with the orange and beer, makes for some great-tasting meat. “I know I’m saying it myself, but I think I’ve done a great job," he says. We agree. Marinate the chicken in beer and Cointreau for 6 hours. Line the baking dish with butter and place the chicken in it and pour the marinade in. Sprinkle half the quantity of pepper and chilli powder, cover with the oranges and sprinkle the remaining half. Now add the pieces of bacon and place in the oven for 45 minutes at 250 degrees Celsius. For the sauce, melt butter in a pan and pour the juices from the baking dish into it. Cook till it becomes thick. Place the chicken on a serving dish, pour the sauce and serve. Tear the lettuce and basil by hand and put in a salad bowl. Add the crumbled cheese, orange and nuts. Top with the dressing made by mixing all the ingredients. Toss and serve.